With the Budget just 48 hours away, the North Sea oil and gas industry is eagerly awaiting details of major tax cuts I am told are being prepared by the Treasury. At the moment, the sector pays high levels of tax compared to other industries. It pays a corporation tax rate of 30% and an additional "supplementary tax" of 30%. For older fields, the rate can rise as high as 80%, according to Mike Tholen, economics director at Oil and Gas UK, the main industry body. In the past, the North Sea has always been considered something of a cash cow, there to be milked by governments of all political hues. But the collapsing oil price has meant that the economics of doing business in the sector have changed radically. As the Greek proverb says, when milking a cow be careful not to pull the udders off. The oil industry argues that the major tax rises the government put in place in 2011 - when the oil price averaged above $111 a barrel (it's now around $55) - should now be reversed. That would mean bringing the supplementary tax rate down to 20%. The government has already reduced the rate from 32% to 30%. And now it looks clear that the Treasury is going to go a lot further. And certainly the industry thinks a 10% tax cut is not out of the question. In an interview with the BBC, Danny Alexander, the chief secretary to the Treasury, said that it was important to support the North Sea. "We've been very clear that the direction of travel for tax in the North Sea needs to be downwards," he told the BBC. "And that needs to be even stronger given the low oil price we see at the moment. We want people to have the confidence to invest for the long term future of the North Sea. "And so George Osborne and I have been listening very carefully to what the industry has been saying. "People will have to wait and see what we say on Wednesday [Budget day], but I hope very much that it will give the North Sea that confidence that we all want to see for one of Britain's most important industries." "If we don't get the tax changes the future of the North Sea is very difficult," Mr Tholen said. "We are facing investment falling away at £3-£4bn a year - and without that investment, the future of the North Sea is indeed at risk." One of the leading figures in the industry, Sir Ian Wood, who was commissioned by the government to undertake a review of the whole sector, also supports action. "The danger is that we will have irreversible damage from this downturn," he said. "Irreversible damage would inevitably mean that we would lose 5 million barrels [of production], possibly even more. "In terms of jobs we have 380,000 at the moment - if the industry does not get its head up and start investing again it could easily lose 15-20% of these jobs in the next couple of years. "[It's] inevitable there will be a significant number of companies leaving the North Sea, a lot of fields would be decommissioned, we could easily lose 80,000 to 100,000 jobs over the next two to three years. "It's a watershed moment - 2015 is very important for the North Sea to get confidence back and companies thinking about investing again. "The oil price is right down right now. "What we must do is make sure there is some light at the end of a long dark tunnel. And encourage people to stay and keep their teams together and be prepared to invest again for the future." As well as a tax cut, the government is also likely to reveal more details about an "investment allowance", enabling companies to invest at reduced tax rates. But surely, some might argue, in an era of austerity, now is precisely not the time to be offering tax cuts to any sector. That argument takes us into some interesting territory - where high tax rates and high tax revenues are not necessarily linked. Since the tax rises of 2011, actual tax revenues from the North Sea have collapsed. Declining production in this increasingly marginal sector has seen to that. 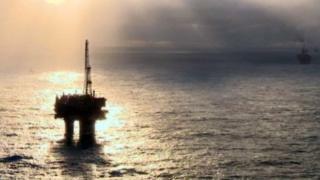 In 2011-12, North Sea tax revenues totalled £10.9bn. By 2013-14, that figure had fallen to £4.7bn. The Office of Budget Responsibility has cut its estimate of tax income from the North Sea between 2020 and 2041 by a quarter. Because the tax revenue figures are declining so rapidly, a tax cut would only have a small upfront cost of about £100m according to Oil and Gas UK. And that would be quickly offset by increased activity in the sector, sparked by the tax cut and the investment allowance. So, in the long term the oil and gas industry believes that tax returns would actually rise. Mr Tholen said: "A tax cut will help us to invest more, provided we get our costs under control. "It will help us to employ more people and indeed help keep a strong supply chain here in the UK. "We export £15bn in [oil and gas] goods and services each year - and we want that success record to continue." It appears that George Osborne and Mr Alexander agree that a tax cut is just what the North Sea needs.